Coles supermarket has recalled two of its private label chocolate products due to undeclared allergen. 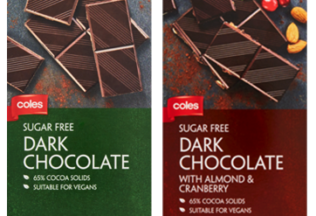 Coles Sugar Free Dark Chocolate 100g and Coles Sugar Free Dark Chocolate with Almond and Cranberry 100g have both been recalled as it was not declared that the chocolate contains milk. The products were also described as “suitable for vegans” on front of pack. All date codes have been recalled. The chocolate has been sold at Coles since 30 March 2018. Customers who have purchased the chocolate can return it to Coles supermarkets for a full refund. Those who have a milk allergy or intolerance should not eat the product. WHAT’S next in the dynamic war on plastic after McDonalds’ decision to phase out plastic straws?